It’s rare to stand out in the crowded balance bike market, but Kiddimoto’s Super Junior Max balance bike has managed to do just that with its creative paint designs. Even my son, who has become a bit bored with testing yet another balance bike, got excited when we opened the box and he saw the black frame with white skulls adorning it. It turns out that being functional is no longer enough—balance bikes have become art as well. Fortunately, the Kiddimoto’s looks aren’t all that there is to praise. The bike has fat, grippy pneumatic tires (a huge plus in my book), a rear hand brake, built-in steering limiter, and 1-year warranty. All of this for a respectable, mid-range pricetag of $110. As already mentioned, the cute paint job is my favorite thing about the Super Junior Max. It also makes it an ideal choice to give as a gift. It seems that retailers would agree with this assessment as big names like Neiman Marcus and Bergdorf Goodman are carrying the bike. In addition to the black and white skulls design that we got, they also offer an equally adorable pastel dot design (see pic below). One of the first things I check when looking at a new balance bike is the tires. Many balance bikes have foam or plastic tires. These are convenient as they don’t go flat, but they also don’t provide the same kind of traction that a good air tire does. The Super Junior Max passed this test with flying colors. Not only does it have pneumatic (air) tires, they also happen to be particularly fat. Fatter tires provide more cushion and better traction than narrower ones. Similarly, the tires have quite a bit of tread on them, which makes them ideal for riding in dirt, on rocks, or over grass. 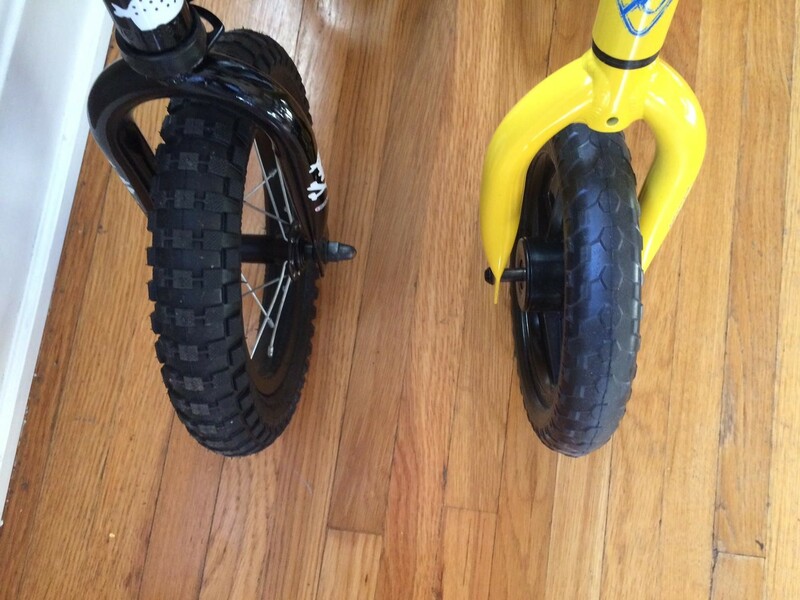 The pic below shows the Max’s beefy air tires (left) compared to the foam tires found on many balance bikes (right). For kids who are 3+, I highly recommend getting a balance bike with a hand brake. 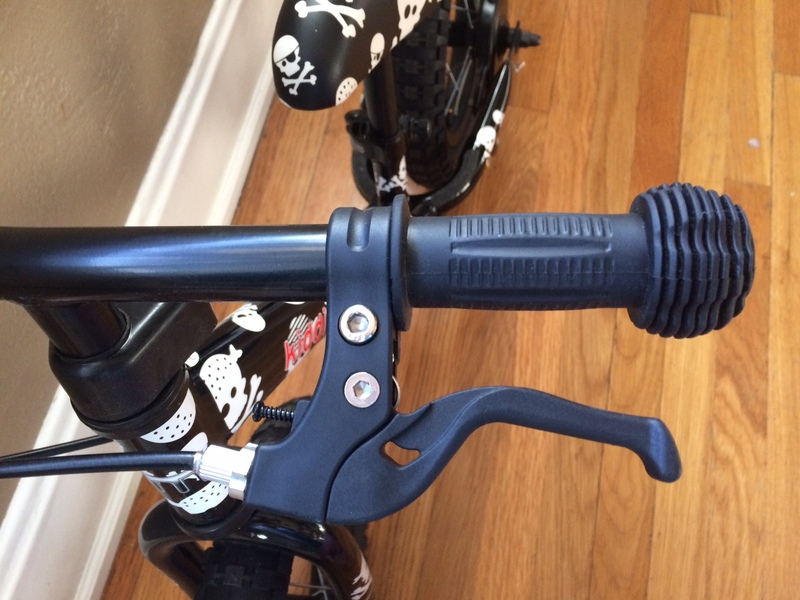 Kids at this age have the eye-hand coordination required to successfully operate a brake lever. By this time, they are also able to move rather quickly on the balance bike, as opposed to the scooting that younger toddlers do. Without a brake, the only thing to stop them is their feet—which can quickly wear out the toes and soles of their shoes. Finally, by learning to operate a brake at this young age, kids develop the skills they will need to transition to a pedal bike without a coaster brake. (For more on this topic, read my article on Hand Brakes versus Coaster Brakes). The Kiddimoto Super Junior Max has a drum brake on the rear wheel that is activated by pulling the child-sized hand lever. While the lever itself is appropriately designed for a tiny hand, it isn’t particularly easy to pull. My 4 year old was able to manage it okay, but when I got our barely 3-year-old neighbor on the bike, he lacked the hand strength to rely on the lever and resorted back to braking with his feet. That said, it is on par with other bikes in this price range. To get a bike with a superior brake lever, you’ll need to spend around $200. The Super Junior Max has a built-in steering limiter, meaning the handlebars can’t over rotate. This makes it safer for young kids, and also keeps them from inevitably getting frustrated when trying to get the handlebars straight after a crash. This 12” bike is advertised for kids ages 2-5. That said, the best way to make sure that this bike will fit your kiddo is to measure their inseam. The minimum seat height is 13.4” so make sure your child’s inseam is AT LEAST that long before buying this bike. It will not fit most 18 month olds, but your 2.5 year old should be fine. The bike’s maximum seat height is 17.7” which means this bike is going to most comfortably fit kids in 3T pants. 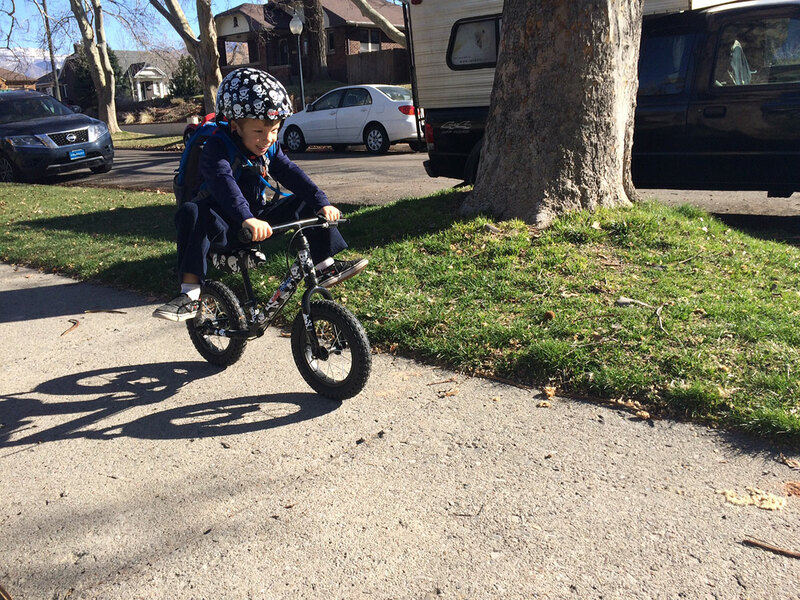 My 4 year old fit on the bike comfortably, but he’s still in 3T pants and there wasn’t much room for growth. A 5 year old will definitely be cramped on this bike. Buy this bike for your 2 year old, and they will get several years of use out of it. If you’re shopping for a 4 year old, look for a 14” or 16” wheel balance bike instead. When this bike arrived, I had strep throat and was feeling miserable, so I turned the assembly over to my husband and kiddo. While the bike had a few more assembly steps than some other balance bikes that we have put together, it came with illustrated instructions and all the required tools. All in all, it took about 15 minutes to assemble and was easily done with a little patience. At 9 pounds, the Super Junior Max is nowhere close to the lightest balance bike on the market, but this is largely due to all the extra features the bike has—those nice beefy pneumatic tires and the rear drum brake. The frame itself is lightweight aluminum, and the bike is easily maneuverable by all but the very tiniest riders. For kids 2.5 years and older, this bike will be easy to handle. The one con about this bike was discovered during the initial assembly. The headset is plastic! In all the bikes that we’ve tested (balance bikes and pedal bikes), I’ve never seen a plastic headset before. While it didn’t seem to present any trouble in our testing of the bike (the bike steered smoothly), I would be concerned about its long-term durability. The headset is one area of the bike that actually takes a lot of abuse, and I can see it cracking. That said, if you plan on using the bike for a year or two and then tossing it aside, you’re probably ok; if you want to hand the bike down to multiple children, you might think twice about this. To alleviate any concerns I may have raised about the plastic headset, it’s also important to note the Kiddimoto offers a one-year warranty on their bikes. This is as good or better than any of the other balance bikes I’ve reviewed. Here’s how the Max stacks up against similar balance bikes. Compared to the popular Strider balance bike, the Kiddimoto Super Junior Max has additional features including air tires and a hand brakes. I’ve also included a comparison to the Glide Mini Glider, as the two are fairly similar; the Kiddimoto, however, seems to have slightly higher quality — and a corresponding a higher price tag. To see even more balance bike options, check out my big comparison chart in my Ultimate Guide to Balance Bikes. 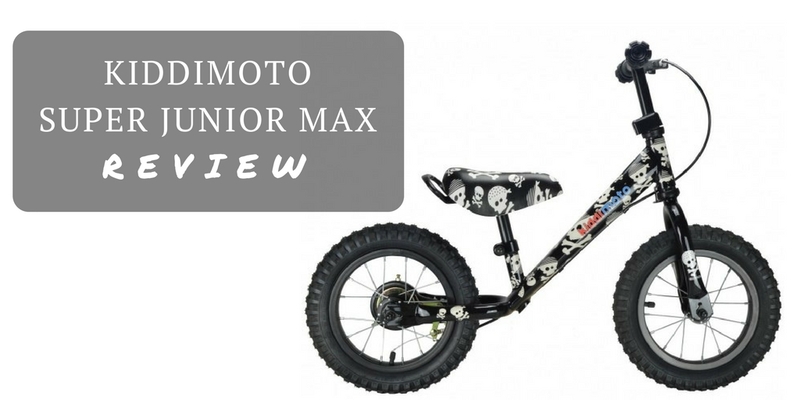 The Kiddimoto Super Junior Max balance bike has higher-end features (beefy pneumatic tires, rear brake, steering limiter) at a mid-range pricepoint. Of course, the real attraction to this bike is the adorable paintjob that makes it a top pick for gift-giving. 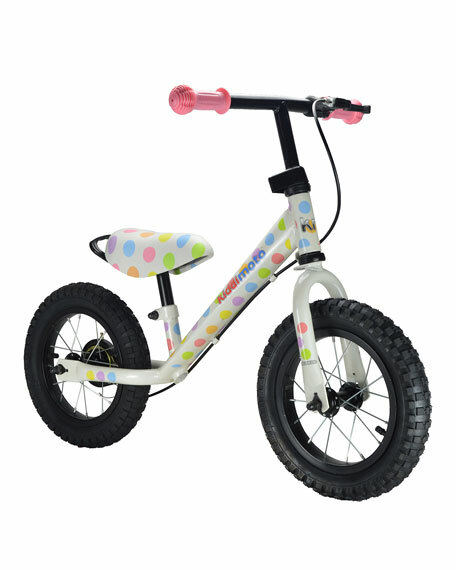 Then again, you don’t need a birthday to give you an excuse—toddlers will love this bike any time of year.